This little gem was something I made up when I really wanted some portabella mushrooms. It’s simple and involves few ingredients, per my usual style. Serves 4. 1. Marinate the shrooms in the balsamic vinaigrette (I use a standard plastic freezer bag) in the refrigerator for 1 hour to two days. 2. Cook pasta according to pasta instructions. Meanwhile, saute mushrooms in a skillet until almost cooked through. 3. 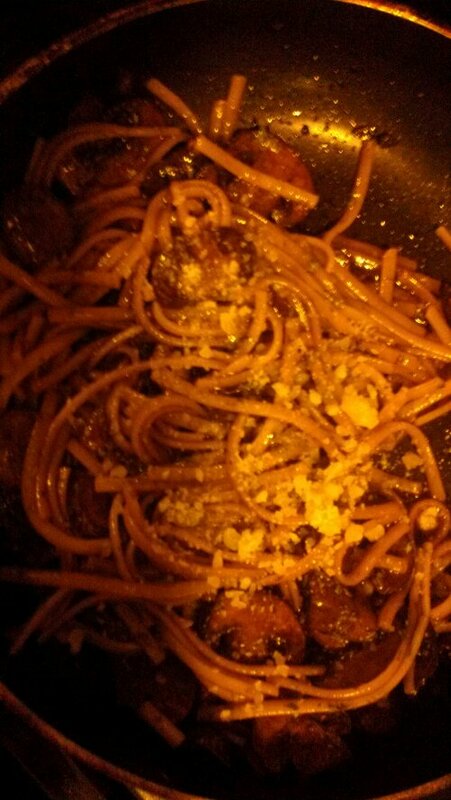 Add cooked, drained pasta to skillet and cook for 3-5 minutes; create some charcoal if desired. 4. Top with freshly shaved parmesan and serve.